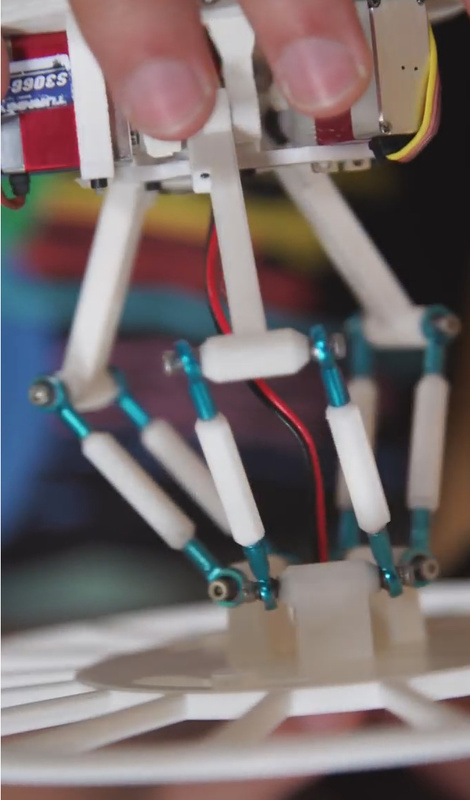 This isn’t the only Pixar inspired robot here on Hackaday. You won’t believe the amount of personality crammed into this Pixar-style lamp. Besides face tracking, it even flicks its switch back on when you try to turn it off. Is it just me, or are Tested’s videos at least 3x longer than they really need to be? It is just you. They make 6x longer than necessary. Very Very cool! Those robots have a lot of personality! This is a tour de force of design and implementation. Exceptional level of talent. Great work. Is it only me, can someone confirm that you can obtain the same movement with only two servos ? I don’t think you could get the yaw (rotation around Z) without three? E.g. it can pitch forward/back, left/right, and spin, each requiring one servo? one to rotate at the bottom, and one to pitch fixed on it, no ? Nope, that’s two. It wouldn’t let the head tilt to one side. The mention of the Sidewinder reminded me of the cool method it uses to track the joystick, which twists on all 3 axes. Rather than using multiple potentiometers, it has 2 LEDs on the moving part of the bottom of the stick, and these sit above a 2D lateral-effect photodiode. By alternately flashing the 2 LEDs and seeing where their light hits the LEP, it can sense exactly how the stick is pushed and/or twisted. Two LEDs are needed to detect the twisting motion. If it were a regular 2D joystick, only 1 LED would be needed. Very cool. Reminds me of the actual moving lamp. It looks like he’s using MKS DS75 servos – so each of those robots has $180 of electromechanical in it. He mentioned (at 10:55) he’s using Power HD DSM-44’s, which are less than $10 each. Oops, we’re talking about different robots. For the jumping robot, he’s using Turnigy S306G-HV’s ($24/each). You can see the label at 21:55. He didn’t say he was doing it on a budget. There’s nothing really hard to do in the electronics or mechanics. Lots of off the shelf hardware and simple 3d printing of pla. The most common filament. Many of us could throw this stuff together with a decent budget. But it’s the imagination and implementation of the whole project. Not many people can design and put something together like this that just looks so good and behaves so right. I can see a lot of copy projects being started right now. Does the Z-axis shaft slide along smoothly through the X’s and Y’s slots when you move both X and Y at the same time? I haven’t installed the motors yet. And my z axis wobbles a bit on my upgraded p3steel. (never change a running system) but with a bit of sanding and a wobble free z axis, yes Sir this thing will slide smoothly. I incorporated an estimated tolerance of 0.15-0.20 mm between the Z axis shaft and the x and y axis. Does fit. Does work. But I am more of a print and build guy. I am afraid of the software part and all that. If I don’t find someone with knowledge and experience in this area the robot might just end up as a paperweight with heating. That is so awesome, I want to build one! Or 10! Watterott carries a few, as does Reichelt.